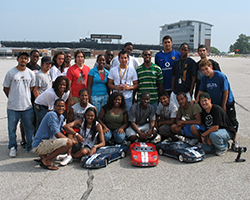 The Mission of the Minority Engineering Program (MEP) at Purdue University is to engage in activities designed to increase and improve the enrollment, retention and successful graduation of engineers. Our focus is domestic underrepresented minorities from African American, Native American, Mexican American, and Puerto-Rican American groups. The founding site of the National Society of Black Engineers (NSBE), Purdue has a rich history of graduating engineers of color - 2,100 to date. MEP activities are divided in to three categories - Outreach, Recruitment and Retention. There are currently giving options for every budget and interest. The giving opportunities listed below are cornerstone gifts essential to advancing the Minority Engineering Program. While we feel it is important to share these funding priorities with you, please understand that each and every contribution is vital to sustaining this very important program. We greatly appreciate your support! Financial support from individuals, foundations, and corporations provides the margin of excellence that distinguishes great institutions from good ones. Nothing better exemplifies this level of excellence than a gift that would name the Minority Engineering Program and provide sustainable funding to ensure this excellence will continue. Naming the Minority Engineering Program will create an opportunity to invest in the future and provide financial resources, in perpetuity, for exceptional students of color. This type of commitment brings incredible distinction and prestige to the program and allows for transformational growth and opportunity. Endowed Directorships are associated with the best universities and colleges around the world and represent prestige, leadership, and profound responsibility for those who hold such positions. An Endowed Directorship for the Minority Engineering Program represents an opportunity for the College of Engineering to define its course in the engineering community and build on the success of one of the very best engineering programs in the world. The investment income from the endowment generates a stable annual income from which a salary for the director is allocated, as well as discretionary funds for the program's benefit. MEP's outreach programs encourage young aspiring engineers by motivating students in as early as the sixth grade to pursue college prep courses complementary to engineering. Outreach programs include Summer Engineering Workshops (SEW) for 6th, 7th and 8th graders, Pre-Freshman and Cooperative Education (PREFACE), and Multiethnic Introduction to Engineering (MITE). Participation in a Summer Engineering Workshops is often the first exposure students have to the field of engineering, to higher education, to college life, and to the opportunities these afford. Workshops take place over a two week period on the Purdue main campus, week one is for 6th and 7th graders and the second week is for 8th graders. Workshop activities consist of hands-on engineering projects, tours of the Purdue campus as well as engineering laboratories and facilities, interaction with engineering students and professionals, presentations from the College of Engineering recruiters on selecting the appropriate junior and senior high school courses in preparation for college, and introductory 'Life-Planning' sessions, which cover topics such as goal-setting, time-management and study skills. Funds are needed to pay for participants' meals and program supplies and expenses. PREFACE provides students completing their freshman or sophomore year in high school with an opportunity to become better acquainted with opportunities in engineering and how their interests and talents can be utilized in this exciting career. The campers spend a week on campus learning about engineering by participating in engineering projects, touring laboratories and facilities, and taking part in team activities focused on study skills and critical thinking. Engineering is stressed as a profession that is used to solve problems that help society as a way to help recruit top talent to both Purdue and the engineering profession. Participants in the MITE program are high school juniors identified through the College Entrance Examination Board and selected on the basis of their PSAT scores, high school grades, and expressed fields of interest. This two-week program provides participants with the unique opportunity to meet and interact with other students that have similar interests and goals, to learn about engineering at Purdue University, and to experience campus life. These camps are a critical part of the program's outreach efforts so funding for these activities is critical as we build a pipeline of engineering students. Recruitment initiatives identify promising prospective students by promoting Purdue's College of Engineering as the college of choice. Activities include Purdue's Recruitment of Multiethnic Students Interested in the Schools of Engineering (PROMISE) and Preview. PROMISE is a three-day program on the Purdue main campus targeted at talented high school juniors and seniors who have expressed an interest in engineering. The program provides information on admissions and financial aid procedures, highlights the first-year engineering curriculum, explains the opportunities available through the Office of Professional Practice (Co-Op) and various internships, and outlines the programs available through MEP. Participants are involved in hands-on engineering projects, shadowing current engineering students to classes, campus tours and the opportunity to interact with students, faculty and staff. 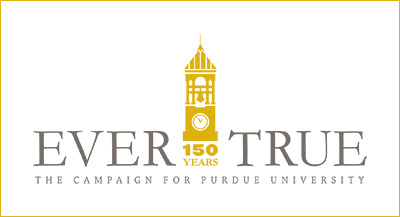 Engineering Preview is offered to students who have been accepted to the Purdue University College of Engineering as well as other universities. Students are invited to a three-day campus experience where they interact with other incoming freshman, meet the professors who teach first semester courses, as well as current undergraduate and graduate level engineering students. The goal for Engineering Preview is for all participants to 'Choose Purdue'! Preview is offered during the spring semester and parents are welcome to attend. A full schedule of activities are planned to ensure that questions are answered and to allow prospective student the opportunity to explore the many support services available to Purdue students. When students choose Purdue, MEP works to promote their academic success. MEP helps students to identify an appropriate engineering field, secure financial support, and encourages them to take advantage of the many programs on campus geared to help them earn an engineering degree. Programs include the MEP Tutorial Center, Academic Boot Camps (ABC), and Engineering 180. 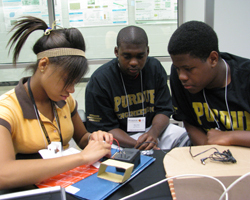 This five-week camp is offered to students who have accepted enrollment in engineering at Purdue and focuses on preparing students for the academic challenges of transitioning from high school to college. Historical data has shown that students are often faced with a wide range of issues that may cause their first semester in college to be particularly challenging. This first semester is often crucial to both a student's college experience as well as their GPA. Held the summer prior to their first year at Purdue, ABC exposes students to the coursework, lifestyle, and pace of college life. Courses are specifically designed to give students a head start on their engineering career at Purdue. A free tutoring service for first-year engineering students is offered through the MEP Tutorial Center. Conveniently located in Armstrong Hall, directly across from the offices of the First-Year Engineering Program, the Tutorial Center focuses on the courses specific to the first year curriculum. The Center is open to all students and offers one-on-one assistance as well as a designated location for studying that promotes team-based learning. Funds will be used to pay the salaries of the tutors, who are upper-class engineering students. This one-credit course for first year students explores the challenges that minority students have in making a smooth and informed transition from high school to college. The course also provides opportunities for students to explore career opportunities. Dynamic guest speakers from a variety of engineering corporations discuss their career paths and share their strategies for success. Engineering 180 is open to all first year engineering students. Funding for this program is used to pay the salary of the undergraduate teaching assistant, who is a senior engineering student.